Destinations: New Year's Parties 2011!! Loungerati recommends the following events for your New Year's Eve celebrations. 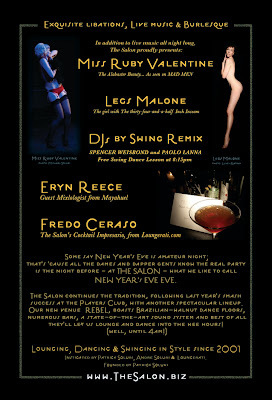 Kick off the fun one day early on New Year's Eve Eve at The Salon's annual party. Lounging, dancing, and great performances! Read more about the history of this alternative New Year's Party here. Then head to Brooklyn for a duo of unique events. Dress to the nines at a 1920s Formal ball at the Montauk Club or treat yourself to an evening of incredible cocktails and exotic fare inspired by the travels of drinks legend Charles H. Baker, Jr. at Fort Defiance. REBEL, boasts Brazilian-walnut...dance floors, numerous bars, a state of the art sound system and we now have all 3 floors (13,000sq ft!) for your dancing and lounging pleasure. Imported from Boston, this band kicks-off the BLUES ROOM at midnight - along with DJ LadyBlues, spinning until the wee hours. Playing an early set on the mezzanine and a late night set on the mainstage. SPENCER WEISBOND and PAOLO LANNA will keep ya dancing all night long. + FREE beginner swing lesson at 8:15 by Spencer Weisbond! The Salon has been sponsored by HENDRICKS GIN and MILAGRO TEQUILA! The first 100 guests to arrive at The Salon will receive a complimentary Hendricks or Milagro cocktail; doors open at 8pm and it's first-come-first-serve, so arrive early! In addition Milagro is offering free tastings of their tequilas from 10pm to midnight! Michael Arenella & His Dreamland Orchestra perform sweet and swinging '30s/'40s era standards for your listening and dancing pleasure. Featuring The Minsky Sisters Ring in the New Year with us in the Montauk Club's historic and luxurious ballroom. General Admission tickets are available at BrownPaperTickets.com. There will be no tickets available at the door, so please purchase your tickets in advance! Enjoy dinner in the Montauk Club's dining room, including the full service open bar. 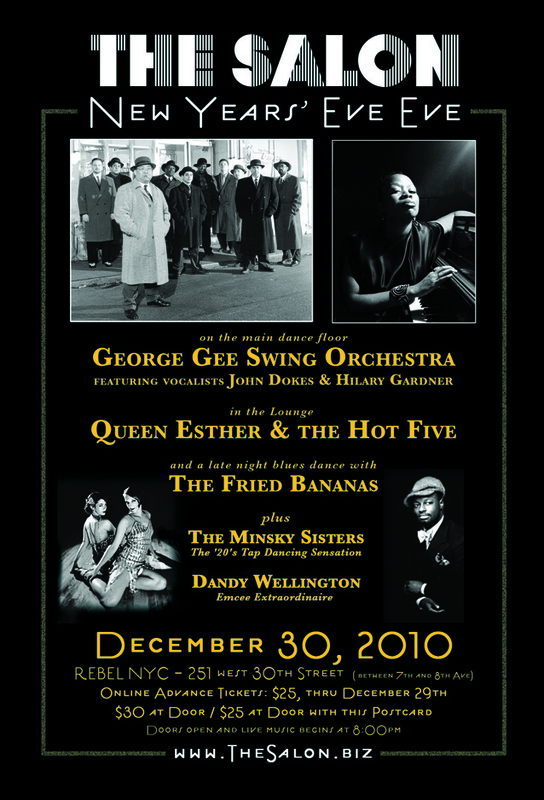 Guests who would like to dine must first purchase a General Admission ticket at BrownPaperTickets.com, then email Jen@Dreamlandorchestra.com to make your dinner reservation. Ticket sales end on 12/30 at midnight. NEW YEAR'S EVE: An Evening with Charles H. Baker, Jr.
St. John Frizell and his crew will be serving a five-course prix-fixe menu inspired by the travels of our favorite globetrotting adventurer of the Cocktail Age, featuring Deviled Lobster from Cat Cay, the Bahamas; the Imperial Cossack Crusta from Shanghai; the Rangoon Star Ruby from Lower-Burmah; and much more! $95 includes five courses, paired wine, and cocktails. Make reservations today! Happy Holidays! Merry Christmas! Buon Natale! Joyeux Noël! For individual portion: Combine ingredients in cocktail shaker, dry shake for 5 seconds to emulsify the egg. Add ice and then shake hard until well chilled. Strain into a goblet and garnish with ground cinnamon. According to David Wondrich's Imbibe! From Absinthe Cocktail to Whiskey Smash, A Salute in Stories And Drinks to "Professor" Jerry Tomas, Pioneer of the American Bar (2007), this cocktail was named after 1840 Presidential candidate Benjamin "Old Tippecanoe" Harrison who ran on a populist "log cabin and hard cider" platform. The Bourbon addition is relatively new, I read about this version in Dale GeGroff's The Essential Cocktail: The Art of Mixing Perfect Drinks (2008) and prefer a stiffer egg nog. We recommend Elijah Craig 12 Years Aged Bourbon which seems to go well in any bourbon drink I roll! This one is a favorite version of the holiday cocktail and can be made virgin with none alcoholic cider. Here are some last minute gift ideas for the favorite tippler in your life. The Fine Art of Mixing Girls by Jack Newcastle. This debut novel is a mid-century comedy of cocktail proportions! Speakeasy: The Employees Only Guide to Classic Cocktails Reimagined by Jason Kosmas and Dushan Zaric. The gents behind Employees Only, one of the most successful bars in New York City, share their recipes, wisdom, and new twists on old classic cocktails using fresh ingredients, juice, and homemade syrups. Lush Life: Portraits from the Bar by Jill De Groff. 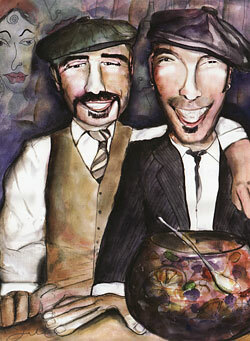 Saloon artist Jill De Groff captures the essence of the spirits community with a unique collection of caricatures of barkeepers, barflies, and booze hounds. Ideal for enjoying that special dram Glasses: 8 Fl. 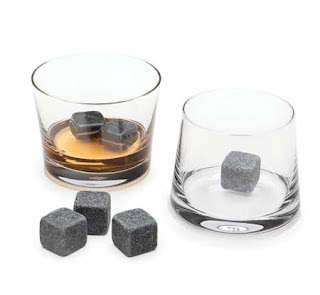 oz | 2 1/2" Tall // Stones: 3/4-7/8" The Set includes 2 mouthblown Avva tumblers (dishwasher safe) and 6 Whisky Stones. Eric Alperin of The Varnish in Los Angeles creates the cocktail aficionado's dream gift basket. The Mixologist Cocktail Boxes include the recipe and the specific brand of spirit that the Mixologist utilize in manufacturing their cocktails. (80 Proof - available only in select markets including New York and San Francisco) Developed by Beefeater’s Master Distiller Desmond Payne, Beefeater Winter Edition is specially formulated for sipping on cold winter nights, with traditional seasonal flavors of cinnamon, nutmeg, and pine shoots. In addition, there is a hint of Sevilla orange peels. These flavors are said to enhance the piney flavor of juniper, the most vital botanical in all premium gin. Perfect in winter punches! Pour Gin in cup a toddy cup and add hot pressed apple cider. Garnish with nutmeg and cinnamon stick. 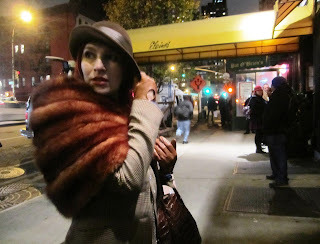 Our friend Kiki Valentine sends word of a great burlesque extravaganza happening at Ella Lounge on Sunday December 19th. The East Village staple "Sunday Show" is having it's final show after a two year run with an incredible cast. This is can't miss - so get on down! Two years after the inception of The Sunday Show (www.sundayshownyc.com), the production bids adieu with a theme of "American Dream". Celebrating the accomplishments of the show, the holidays and more with a night of show-stopping performances by one of NYC's most incredible all-star casts! Saying goodbye is never an easy thing, but we're not going out without some fireworks. And there will be surprises. - Legs Malone "The girl with the 34 1/2" inseam"
- Calamity Chang "The Asian Sexation"
- Coco La Pearl "The world in a grain of sand"
- Grace Gotham "Vaudeville en Vogue"
- Justina Flash "Hoops aglow"
- Leta Le Noir - "Ginger hair down to there"
- It's A Little Stormy - "What A Wonderful World"
- Juliet Jeske - "Holiday Princess Sunshine"
- DeWitt Fleming Jr. - "Tap-tastic songster!" - DJ Blacky 2 as "Mr. Muhammadisnotsobad, the sensitive terrorist"
The announcement will be made before the performance downstairs begins. *THE SUNDAY SHOW will be followed by, portraits, vino, live music and performances by fire performer Coco La Pearl. Upright bass by Matt Brandau, Brad Ross on piano and the superstar singer/dancer Dewitt Fleming 10 to 11. Or until we're all tipsy enough to carol. MUST BE 21 TO ENTER. This is NOT "Burlesque" starring Cher & Xtina and will contain situations the Motion Picture Association of America clearly would NEVER allow on screen! Raffle prizes include the bubbly, the sweet, the artsy, the coveted and a lap dance. How about an old time battle of the big bands, a gorgeous wooden dance floor, and an excuse to put on your finest attire? Hit up Michael Arenella's Winter Ball at the Green Building in Brooklyn this weekend for your vintage fix. 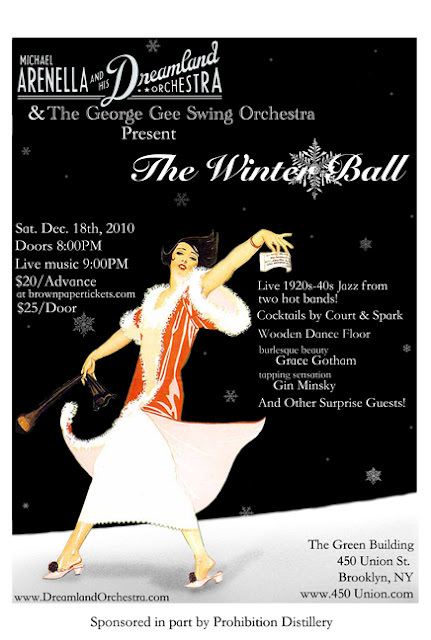 Michael Arenella & His Dreamland Orchestra and The George Gee Swing Orchestra partner up to present December's hottest holiday dance event. - Special surprises to be announced! This Saturday evening head on over the the Green Building in Carroll Gardens Brooklyn for a unique spirited events that combines tasting liquors with holiday shopping. Plus, Fette Sau will be serving it's pork goodness to fill your stomach while you taste! NYC’s cocktail insider The Dizzy Fizz is selecting the finest beverage brands, booze authors, purveyors of party accessories, craft designers, and more to participate in the first-ever Holiday Spirits Bazaar! GET INSPIRED to host an impressive holiday bash of your own! A portion of proceeds will benefit the Museum of the American Cocktail. A silent auction, featuring original artwork by Jill DeGroff and more, will also benefit the museum. Live DJ throughout the night to keep the good times flowing! Don’t miss out on this fantastic one-night tasting and shopping extravaganza! Sponsors include: Denizen Rum, Auchentoshan Single Malt Scotch, Tempus Fugit Spirits, Vermont Gold & White Vodka, Cockspur Rum, Classic & Vintage Spirits, Purity Vodka, Denizen Rum, Scorpion Mezcal, Redemption Rye, Don Q Rum, Hudson Whiskey, Solerno Blood Orange Liqueur, Pipeline Brands, Highland Park Single Malt Scotch, Chairman's Rum, Castries Peanut Liqueur and Innis & Gunn Cask-Aged Beer. Happy Repeal Day!! Three Cheers to Utah! Party like it is 1933! Seventy seven years ago today, the 21st Amendment to the US Constitution became law. This piece of legislation repealed the 18th Amendment's Prohibition of alcohol. The last state to ratify the amendment in the State conventions, thus passing the 3/4 majority required to amend the Constitution under Article 5, was Utah! So three cheers to Utah! Today is also the Fourth anniversary of Loungerati. 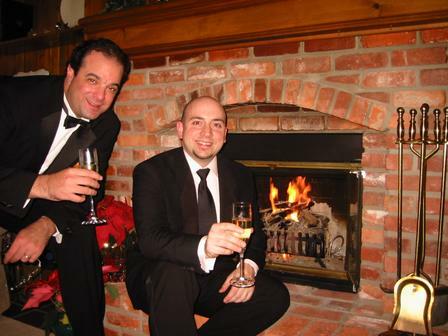 In 2006 as the lounge website Tommywhitetie.com was closed down by its' founder, a select group of Loungers refused to go quietly. It wasn't last call yet, and there was an open bar of opportunity and ideas. Loungerati was born on a cocktail napkin at Brooklyn Social in Carroll Gardens, Brooklyn. It continues to serve as an outlet to those who enjoy Lounge culture, the sporting life, exquisite cocktails, classic music, and a good time! Tonight, I received a text from one of the partners behind WeatherUp Tribeca - the bar would be opening to the public at 7pm. WeatherUp Tribeca is the Manhattan branch of Katheryn Weatherup's eponymous Brooklyn cocktail den. Katheryn's keeps her signature white tiles, square yellow lamps, and intimate olive colored leather banquettes, that made her Prospect Heights bar reminiscent of a Paris metro stop. The noticeable difference is spacial. WUT is about twice the size of the Prospect Heights original. The long marble topped bar is much friendlier for large parties and gatherings. There is also ample seating. Richard Boccato of Dutch Kills is also on board this venture. In addition to designing the cocktail list, he adds his singular devotion to ice into the mix. Loungerati attended the "Friends and Family" night several weeks ago and based on what we saw, awarded the Weather Up the "Don't Bruise the Ice Award" for best ice program of 2010. They have an in house ice block machine - take that Kold Draft! To help wash down those Boccato's drinks, WUT will be serving fresh oysters and caviar plates as well as other bar snacks to pair with your libations. So celebrate Repeal Day at the newest addition to New York's stellar cocktail scene. Order the mouth watering Kensington Fix and a plate of super fresh oysters. You deserve it. Combine ingredients in a mixing tin, add ice and shake until well chilled, strain into a frosted highball glass, add crushed ice, and garnish with lemon peel. The work week was winding down when the call was received. The “quarter to five call on a Friday is rarely a good thing,” I said aloud. 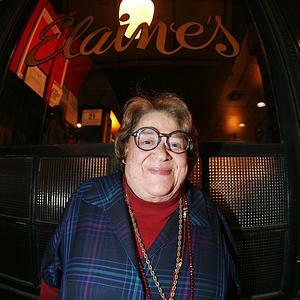 It was my pal and Loungerati founder Fredo informing me that Elaine Kaufman had passed away. I locked up shop, grabbed my scarf and topcoat and walked down the middle of a freshly paved street, still fresh with the scent of tar. A half block later, I was in front of Elaine’s. Outside, I met Grace Gotham who years earlier (with her husband, Governor’s Island Coordinator Mr. Gotham) had first introduced me to dear Elaine, over one rather very memorable plate of linguine with clam sauce, served perfectly al dente. Though big names and the publishing elite made Elaine’s famous, as the Gotham’s and my wife and I had discovered, you didn’t have to be a celebrity to pass her personal test and join her circle. The door of Elaine’s was locked last night but Grace and I were welcomed in and sat amongst the privileged nine people allowed in for the first hour of operation. We saddled up at the elbow bend of her 25 foot mahogany bar. I snatched a Rusty Nail, Grace ordered champagne. We promptly joined in on tales about Elaine and all of her magic. I learned of one patron who was recently hauled off to an awaiting ambulance. He ordered a refill, using his cell phone, while in the stretcher. One of Elaine’s waiters stepped outside to the double parked ambulance and served him up. Now THAT’S al fresco! Incidentally, after the ER visit, the patron returned for a late supper. I learned how decades earlier, when Marcello Mastroianni met Elaine, he too had the same perfectly al dente linguine. 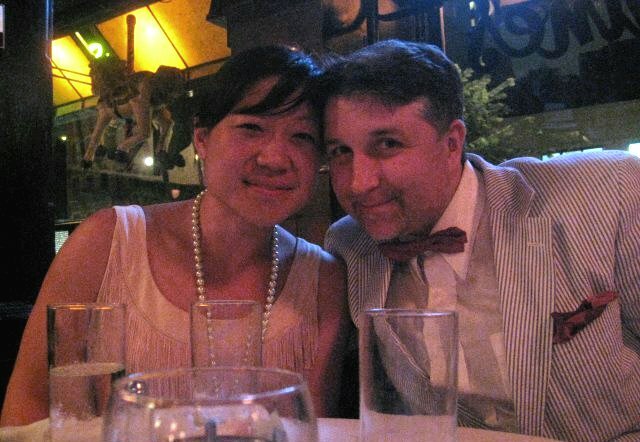 Since that first introduction, Elaine presided over such memorable events in my life as the first dinner I shared with my now wife, phase four of the bachelor party (kissing only the most handsome of the lot and making a point of telling us that! ), and an anniversary dinner or two. 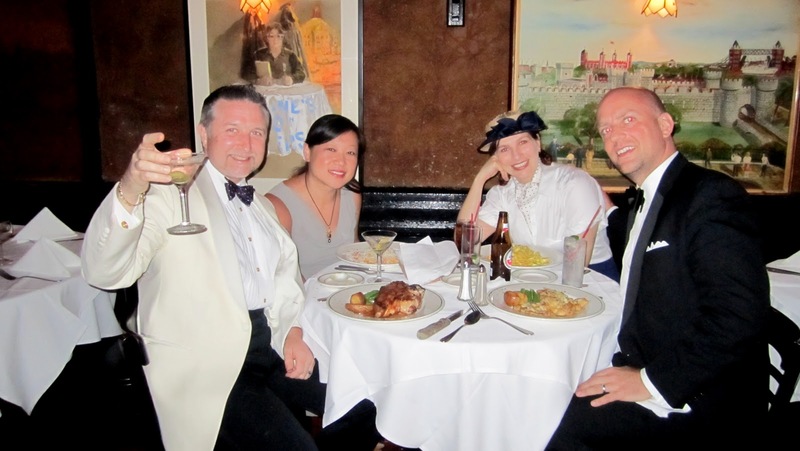 When Elaine learned of my love for swing, she insisted we only be seated at Noel Coward’s old table. Hell, she even appeared in my wedding announcement (and saw it before I did!). She opened up her living room to family and friends. Elaine was New York. But this particular night, was different. With news vans surrounding the joint, floodlights blazing, and folks being interviewed inside and out, there was but one thing missing. Rest sweetly, Elaine. 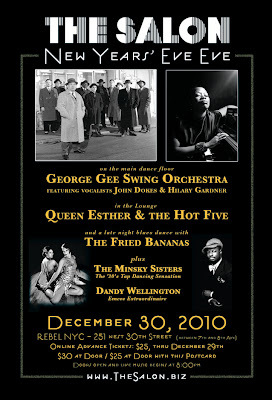 In December of 1999, swing music promoter "Lo-Fi" Lee Sobel threw a legendary party at New York's Webster Hall. The date was Dec 30th, two days for the beginning of a new decade, and it seemed like the whole city packed the historic ballroom in their best 1940s attire. He dubbed it the "New Year's Eve Eve Swing Ball." In later years, Lee kept the party going at the gorgeous art deco Supper Club ballroom and it typically featured as many bands as there were bars, on two floors and multiple rooms. New Year' Eve Eve became the scene's must attend event. 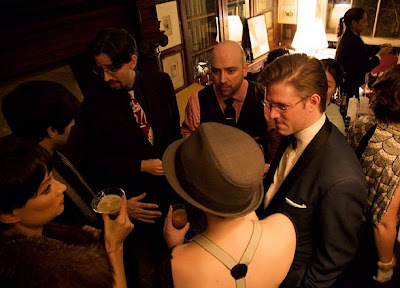 It was a time when retro/vintage culture aficionados, loungers, swing dancers, rockabilly scenesters, and everyone in between put on their finest duds and reconnected before the New Year. It also turned into a real money maker for Lee's production company because it was regarded a special holiday gathering for everyone in the community. People who never went out made it a point to attend the Swing Ball. However, as the retro scene splintered and evolved, the Swing Balls came to an end. We caught up with Lee recently and he was pleased to see the tradition continuing. I asked him what prompted him to choose NYEE as the night to stage such a party instead of New Year's Eve. "It's cheaper to rent a venue the night before NYE when the clubs clean up and expect to make the most money for any single night. They generally don't have anything booked the night before because 'mainstream' people shoot their wad on NYE and don't usually go out the night before." The event may have been born from convenience and an eye on keeping costs low, but ten years later, it has become much more. Lo-Fi Lee is currently working on a book about the retro movement of the 90's which bubbled up from several scenes including lounge, ska and rockabilly - the pinnacle of this was the swing scene which brought the music, cocktails, dressing up, and dancing together into one beautiful package and was embraced by the mainstream for a few years before we turned the corner on the new millennium. The Salon, a party instigated by brothers Patrick and Andre Soluri picked up the New Year's Eve Eve mantle in 2006 throwing a dazzling fete on the west side that featured the Todd Londnigan Big Band, belly dancing, burlesque, and a farewell toast to the tommywhitetie.com lounge website. It was to be the last party for a while until the brothers joined forces with former Piano Store producers Prohibition productions and Loungerati to resurrected the event in 2009. 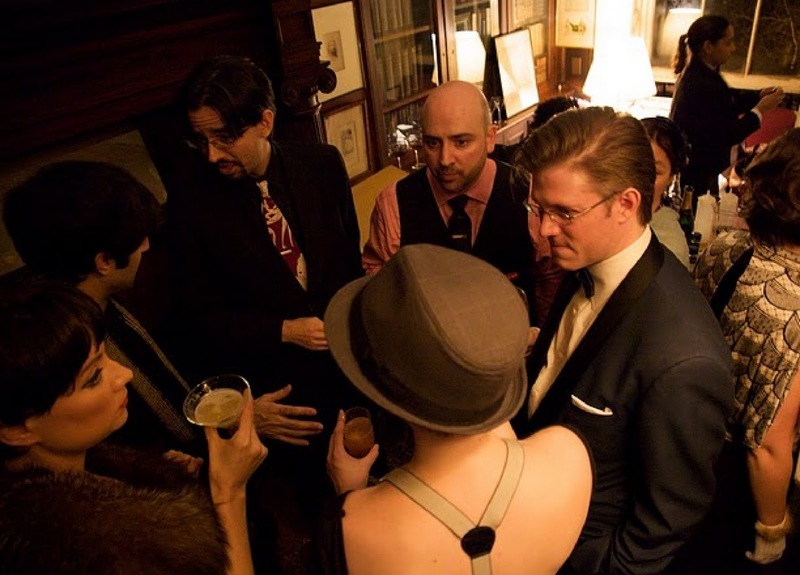 What followed was the year's best attended party that packed two floors of the iconic Players Club on Gramercy Park. "We are not line around the block type people." exclaimed Andre when he surveyed the hundreds queuing up to get into the historic mansion. The line wrapped around the block to Park Avenue. This year, The Salon continues the tradition at a new venue, called Rebel NYC (which is owned no less by the same group behind the Webster Hall). A fitting end cap to a decade of New Year's Eve Eve parties but certainly not an end to the biggest night of the year. The Gal with the thirty four and a half inseam! 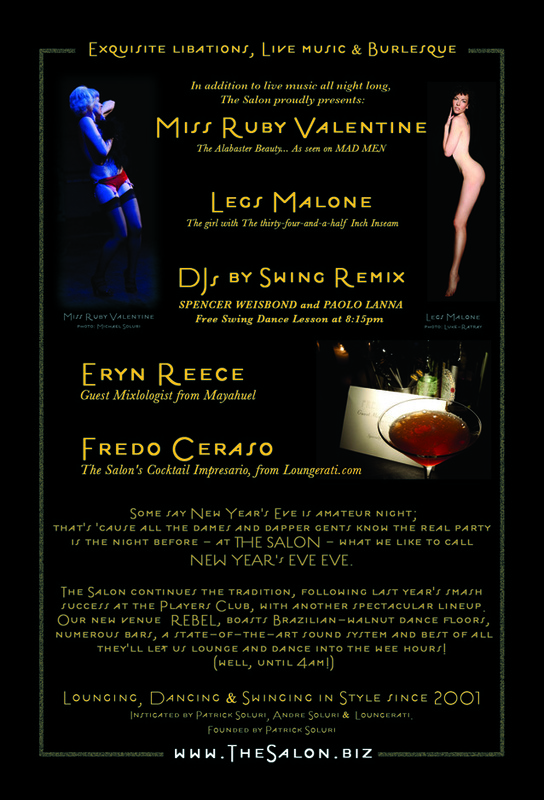 The Salon's signature commitment is equal billing for quality performances, dancing, AND cocktail culture. This is quite fitting for a party that Patrick began 11 years ago while in graduate school at the University of Louisville in Kentucky - home of Bourbon Whiskey! In that spirit of bon vivant, Loungerati's Fredo is quite honored to once again be included in The Salon's 2010 NYEE party as their in house cocktailian. On the libation front, we have special guest bartender Eryn Reece of the award winning Mayahuel cocktail bar joining me behind the stick.